I made it to my first Minnesota Twins baseball game in our new outdoor stadium. During the course of the evening, I was present with this fabulous rainbow to take photos of, darn the luck! June 1st is the monthly Theme Day photo, then be prepared for a few photos of the new ballpark. I have to say, I know nothing about this building. I believe it's some sort of bar, the smaller sign reads 'Blues Saloon'. I would have to guess the place has musical entertainment in that music genera. I pulled up to a four way stop sign and saw this building for the first time....as a photo blogger, how could you not take a photograph of this great looking building? Just looking at the building, it's obviously had a make over recently. I would have to guess, this may have housed a small business on the first floor at one time in its history with living space on the upper floors. That's very common in the Twin Cities as I'm sure it is with many cities with this type of building. I would imagine, the paint job is to mask the different colors of brick. I would bet there was lots of glass on the first floor, but has now been covered. Just a guess, but I'm sure someone has a historic photo of this building. 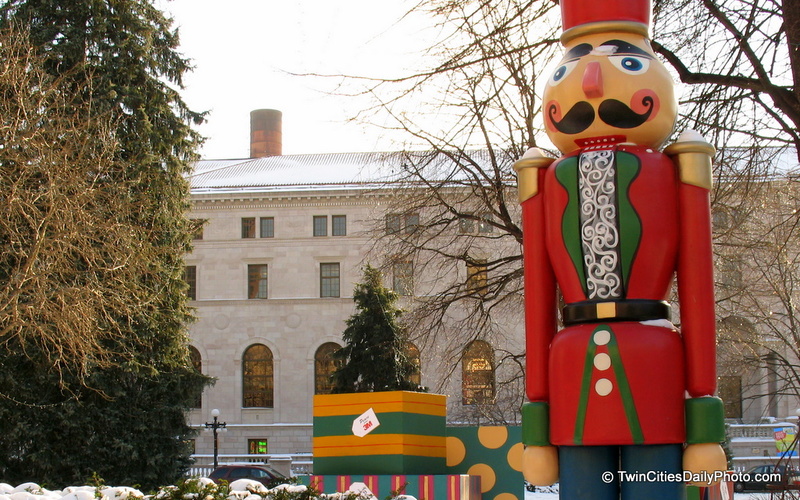 It is located in St Paul, on the corner of Western Avenue and Thomas Avenue. Yesterdays photos of Miss Mitchel, posted on May 25.....I captured this photo set of one of eight remaining B-25 Bombers from World War II at the Commemorative Air Force Museum in South St Paul airport, Flemming Field. The CAF Museum survives on donations and hanger rentals. They often host other events at the hanger to raise funding to keep the museum open. Last weekend, they held a pancake breakfast open to the public, plus they were giving out 15 minute plane rides. If your looking for a place to host an event in the Twin Cities, they will rent out their hanger as well, quite a unique location. Meet Miss Mitchell, she is a B-25, one of eight remaining Doolittle Raiders. There was 16 B-25 Mitchell Bombers launched from the aircraft carrier USS Hornet on April 18, 1942. The Doolittle Raid was the first air raid by the United States to strike a Japanese home island during World War II. The raid was planned and led by Lieutenant Colonel James "Jimmy" Doolittle. Miss Mitchell was at the Commemorative Air Force, Minnesota Wing, WWII Air Force Museum at Flemming Field in South St Paul. I just happened to be there at the CAF hanger/museum during a Raider Reunion to capture these photos. 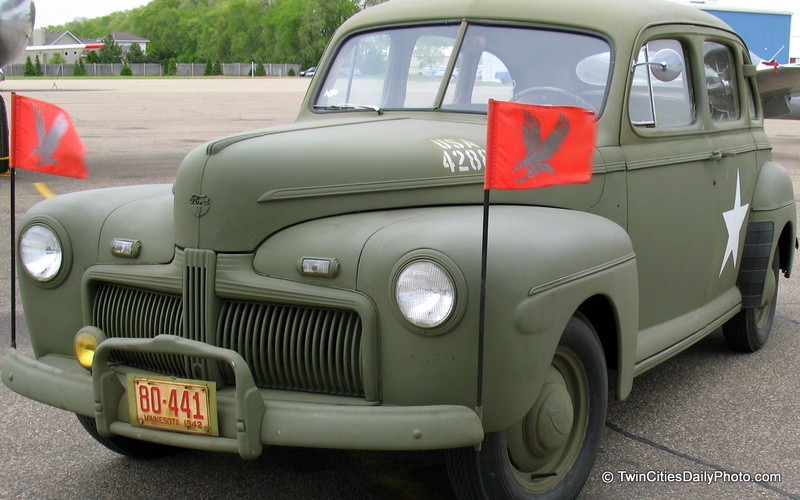 From what I could reference, this is a 1942 Ford Staff car for the US Army. Essentially it is a 1942 Ford Sedan with a military paint job and a few other customizations done too it. Shape wise, very similar to the 1941, but the front grill is much different between the two years. I've seen the 5th Avenue Plaza sign many, many times before....but the plaza is rather small in comparison to today's strip malls. This sign can be found on Upper 55th Street, which is the border of Inver Grove Heights and South St Paul and of course 5th Street. However, it's called 5th Street in South St Paul, but once you cross the border into Inver Grove, the street name changes to Carmen Avenue. Believe it or not, about one block over and two blocks to the north from Tuesday's photo is the Nickel Joint. The Nickel Joint also carries the Schmidt Beer logo above their doors. Now I can say that I have been in this establishment in the past, once that I'm aware of. It was for a surprise 30th birthday party for an aunt of mine. While driving, I did a double take and had to drive around the block to verify what I just saw in this photo. Upon further review, my vision was correct. I did just see a bar named "Family Inn". Does that seam strange to you? The Schmidt Beer sign is actually becoming a sign of the times. Schmidt Beer has not been brewed in St Paul in, hummm, 15-18 years now? These signs are becoming harder to find as the old places go out of business. On Friday I attended the graduation ceremony for the Class of 2010 at Inver Hills Community College. There was a little over 200 graduates earning their diploma in several different career paths. I am proud to say, my wife was among the Class of 2010. Way to go, you did it!! The entrance sign to the Cottage View Drive-In Theater. I've gotten word, the Cottage View Drive-In will be open for at least two more years! From all of us drive-in theater fans, we couldn't be happier. From my understanding, with the downturn in the economy, the interest in purchasing the land is dead. Thus, at least two more years the theater will be open. Found this....some sort of plow. My first thought was it was farm equipment, but the more I look at it, I don't know for sure. None the less, it is located near Concord Street in Inver Grove Heights, one block south of Highway 494, take a left and you've made it. Michele Bachmann spoke at the 2010 Tax Cut Rally on Saturday at the State Capital. I'm sure many are not familiar with Michele Bachmann is the incumbent Republican candidate for US Representative from Minnesota's 6th Congressional District. I am amazed by the hatred people have for Michele Bachmann, the spin on her words, vicious attacks, it's really crazy what she and many politicians must go through on a daily basis. Back in 2008, I made a couple trips to the Republican National Convention to photograph what the events that took place, those photos can be found here. Saturday, I paid a visit to the State Capital Building to photograph the 2010 Jason Lewis Tax Cut Rally. This was my second political event that I've photographed and I will say, I had zero fear of being tear gassed, tazed, caught in a riot. It was peaceful, families brought their children, and some of the signs were priceless. The weather was a bit of a downer, windy, low 50's, a bit of rain here and there. This photo was one of the first photos of the day that I took, which was about forty minutes before the main speakers hit the stage. I was behind the stage, while MC, Chris Baker was making some announcements. Does this building remind you of those building blocks you played with as a child? All it needs is letters printed on the colored panels. I'm glad I captured this building before the leaves started to bloom again. One more 'statue' photo for May's Theme Day. This one comes from the St Paul Winter Carnival. 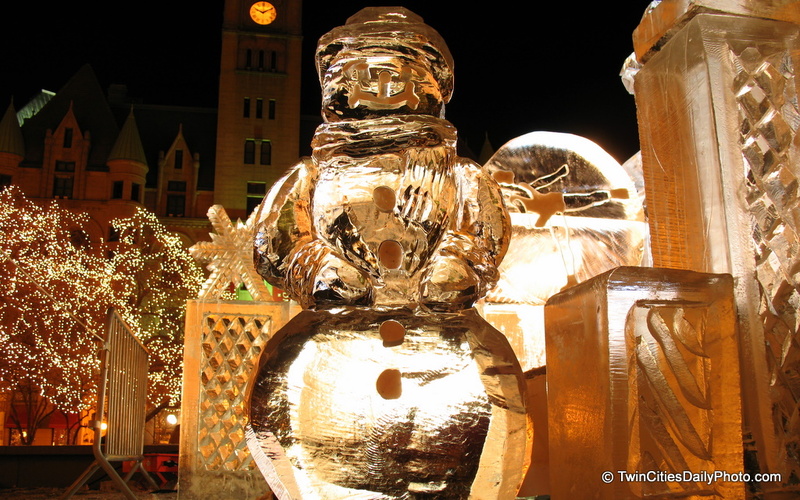 It was taken in Rice Park on a sub-zero degree evening. The snow man ice sculpture stands about three feet tall, I had the camera on a seven inch tripod, sitting on the frozen tundra. Greetings to all of the Theme Day photo bloggers viewing all of 'statue' photos. So, what photo does one use when the them day is 'statues' and you want to stand out? How about a fifty foot statue of a mermaid? 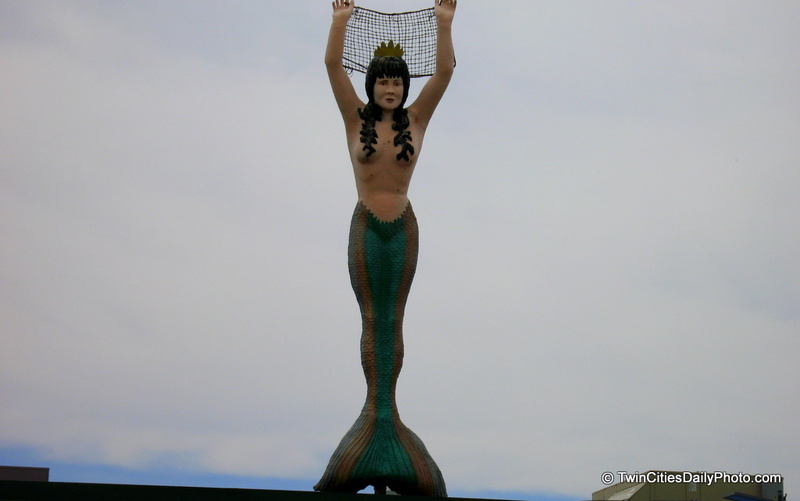 This mermaid statue sits high atop the restaurant with the very same name of, The Mermaid. Did you really expect something different for their name? Wanna see it in person, you'll have to be in Mounds View on Highway 10 for it to happen.